Difference between revisions of "San Francisco's Victory Gardens"
I remember funbling a line or two. (I spoke from notes, but didn't dare look at them.) I suddenly found myself saying things that came clearly to me. By the time I finished my 40-minute talk, I began to feel like a veteran. Evidently, whatever I said was well-received, and I was invited to speak to four other groups. I remember fumbling a line or two. (I spoke from notes, but didn't dare look at them.) I suddenly found myself saying things that came clearly to me. By the time I finished my 40-minute talk, I began to feel like a veteran. Evidently, whatever I said was well-received, and I was invited to speak to four other groups. We immediately set up goals. Harry Nelson trained a large number of City College instructors to go out into the neighborhoods to teach and advise homeowners on the same idea as the 12 Apostles spreading the faith. They concentrated on vacant lots. There were many during that period before San Francisco became a wall-to-wall community. We eventually had family gardens in Golden Gate Park, Laguna Honda, and at the Civic Center. An excerpt from John Brucato’s memoir, "A Sicilian in America," where he describes his role in the birth of San Francisco’s “Victory Garden” movement during World War II. With food looked at as a weapon of war and the government telling the public to ration or grow their own food as to leave more opportunities to feed allies and troops, Brucato teamed with the local afternoon paper The San Francisco News, to give San Franciscans an informed lesson on how to grow successful victory gardens for their families and neighborhoods. 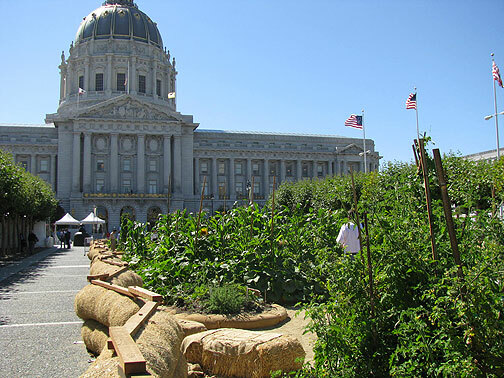 With the help of civic leaders, Brucato formed the San Francisco Victory Garden Council. With small gardens in backyards and large city funded projects scattered throughout San Francisco, Brucato’s brainchild flourished and was a model for cities across the nation. Commitment and civic involvement has had much meaning to me. To work without commitment renders no satisfaction or pride of achievement. Not to contribute to society is an ungrateful way to go through life. I remember how important this thought meant to me during the period of World War II. Food was considered one of the most important weapons of war. There was a shortage of food nationwide. Everyone was on rations and conditions were not improving. We were not only feeding ourselves, but our allies as well. In the winter of 1941, a series of articles appeared in the San Francisco News, a then-prominent afternoon newspaper owned by the Scripps Howard newspaper empire. These articles appeared daily and concerned the growing of vegetables in your backyard or vacant lot. They were good articles, but the timing of their appearance was wrong. The stories advocated planting tomatoes, zucchini, string beans, and other warm weather crops that grew only during the summer months. It happened to be December. This caught my immediate attention. How in Heaven's name can a responsible newspaper print such misinformation? I could have let it go and continued to take care of my winery business. I decided to call the city editor who turned out to be Charles Massey. I explained my feelings to him and he said, "Why don't you come in to see me so we can talk about it?" I accepted and was in his office at the old San Francisco News the following day. Massey was rather impressed by our meeting, particularly with my knowledge and agricultural education and background. Charlie, as he was called, suggested that I write a series of articles on "Victory Gardens." To this, I replied, "Give me a few days and we go." The series was entitled, "A Victory Garden Guide for San Francisco." It ran for six consecutive days with the response so great that Charlie suggested I get together with Louise Weick, the garden editor. That's how it all started. 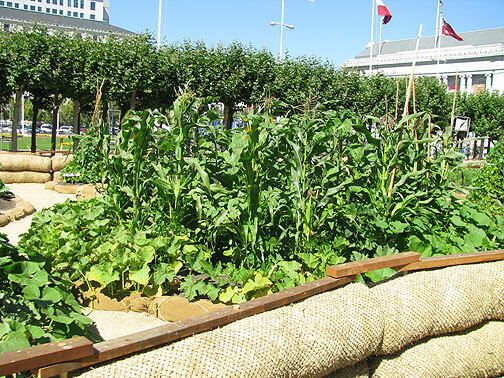 As a result, a War Garden Committee was formed to publicize the raising of vegetables in San Francisco. In the meantime, I continued my writings with another series of articles describing the problems facing farmers raising food for the war effort. It was entitled, "War Comes to the Farmlands," and ran for five consecutive days in the News. These articles attracted wide attention and it did make it rather easy to form a good representative committee. I heard from Clarence Lindner, publisher of the San Francisco Examiner. He offered the resources of his newspaper and assigned his garden editor, Oliver Kehrlein, to work with me. That was great. My brothers encouraged me to get involved. Frank Clarvoe, managing editor of the News, called to say that the pages of his newspapers were available. His last words were, "Let's get going." I wanted a sponsor. I thought of Bill Carroll, the county agricultural commissioner, but he was too busy because he was shorthanded. It was suggested that perhaps the San Francisco Junior College, which had a horticultural division, could be of some help. This is where I met Harry Nelson, who was head of the horticultural division and had, at various times, written articles on growing vegetables at home. Harry and I hit it off immediately. We had much in common and spoke the same language—food. Harry Nelson suggested that the president of San Francisco Junior College (later it became the City College of San Francisco), Archie Cloud, might be interested. In this respect, I believe I met one of the most fascinating and lovable persons ever. He was about six feet, six inches; I was five feet, eight inches. He had recently written a book telling how he stole the coveted axe from the Stanford University campus prior to the annual Big Game with the University of California at Berkeley. It became quite an issue between the two rival universities. Dr. Cloud, without hesitation, agreed to sponsor the San Francisco Victory Garden Council. The headquarters was to be at the college and all the facilities, particularly the horticultural division with Harry Nelson, was to be at our disposal. He immediately named me chairman of the council. We invited representatives of all the city's garden clubs, organizational service groups, labor groups, and any others willing to participate. At the meeting, they unanimously approved my chairmanship. We went to work and the garden editors were our outlets to reach the public. Henry Budde, Sr., owner of the vast chain of neighborhood newspapers (later known as the San Francisco Progress), became one of our biggest backers. He was also on the Park Commission, and his influence, political and otherwise, played a large part in the success of the program. The general feeling was that raising vegetables in San Francisco was not feasible. There was too much fog, sand, the summers were too cool, and many other objections. That was the challenge. Since it was wartime, we became a part of the Civilian Defense Program. In this respect, I was to become associated with the city's leading politicians, educators, bankers, socialites, and people who were the acknowledged leaders of the Bay Area communities. Mrs. Alfred Ghirardelli, representing the Red Cross, Mrs. Clarence Coonan from the American Women's Voluntary Service, and many others offered their services. They were Max Leonard, agricultural commissioner from San Mateo County, agricultural editors from Sunset Magazine, and legions of interested people from every walk of life who became part of my team. The first big project was Golden Gate Park where Julius Girod was the superintendent. With his advice and assistance we developed 400 plots of 20' x 20' gardens. One section was on Ninth Avenue and South Drive; the other at the entrance of Fourteenth Avenue and Main Drive. San Franciscans became excited. The 400 plots were assigned in three days to 400 families. The Park Commission, thanks to Commissioner Harry Budde, Sr., provided the amateur gardeners with free water, fertilizers, insecticides, utensils, seeds, and many plants. It was a fun project which brought people together. They had common problems, vegetables that is, and many a long relationship resulted. The American Women's Voluntary Service (AWVS), a group of volunteer women in uniforms involved in great depth with providing many wartime services, jumped into the program in a big way. We arranged with the city's Public Utilities Commission to turn over to the AWVS the vast 30-acre future reservoir site on O'Shaughnessy Boulevard and Portola Drive below Twin Peaks known as the Glen Park Reservoir Site. Over 350 gardens blossomed in this area overlooking the city. It was rather a windy site; nevertheless, the vegetables flourished. As the food shortage became acute, more people turned to the land. They called it the "Backyard Revolution." Our program became a model and was copied on a nationwide basis. The Department of Agriculture told us that we were the best organized county in the western states, and perhaps in the country. It was no time to rest on our laurels. On the contrary, we redoubled our efforts to do something bigger, better and unusual. 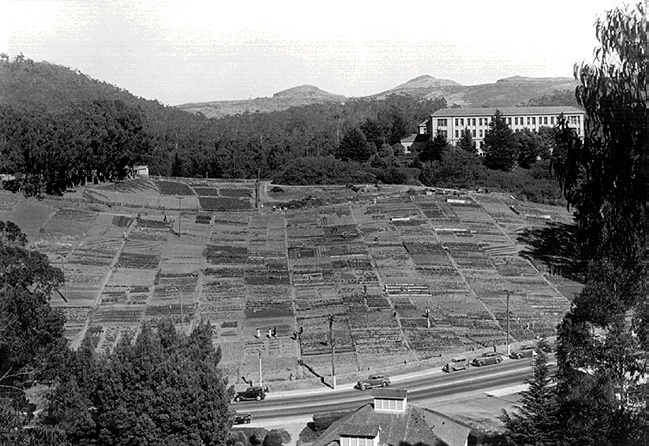 Victory Gardens off 7th Avenue beneath Laguna Honda, 1943. The Laguna Honda Project became the largest community-sponsored project in the state, according to the U.S. Department of Agriculture. Laguna Honda was a county-operated hospital and contained a vast area of grassy, gentle slopes. The council secured from the city their approval to farm the two sides of this hospital complex on the Seventh Avenue slope and the Portola Avenue side. It was a gigantic undertaking and was successful because everyone helped. The city's park department plowed the land and agricultural experts set out the garden plots. Each plot contained 900 square feet, a rather sizable garden. Lots were drawn and the first 400 families to qualify received a parcel of land, free and clean. We also provided picnic tables so that families, particularly on weekends, could farm their plots and enjoy a picnic lunch as though they had traveled many miles. It was one of the joyful aspects in our grim war for survival that seemed to be getting worse with each passing day. The honorable judge, William O'Brien, was our philosopher who added color to his project. As one of the gardeners put it, "He who has his fingers in the soil, is close to God." Victory Gardeners exchanged their crops so that those who had too much of one vegetable traded with others who were short of that item and heavy in another. They also shared in the exchange of seeds, tools, and also, help. One day, one of our Laguna Honda gardeners noted a white gopher or albino gopher enjoying one of his choice carrots. (Today, white gophers are a rarity.) I was advised by experts from the University of California that an albino gopher represents one in ten million gophers. Art Caylor, a writer for the San Francisco News, and other columnists had a field day with the "Albino Gophers of Laguna Honda." Caylor visited the project to get a first-hand idea of what was going on. As a coincidence, one of the gardeners had just trapped a second albino gopher. Much to his delight, other gardeners told him that a total of four albino gophers had been caught. Taking the University of California's figures of one albino to ten million, Caylor wrote the following in his column in the San Francisco News: "According to the learned projections of the university experts, there should be a total population of 48 million gophers." We sure had a lot of gophers to contend with and hoped that the remainder of the 48 million were very far away, like in Texas. One of our big triumphs was the California State Garden Club Conference in San Francisco. The main order of business was the Victory Garden. Lo and behold, I was selected to chair the meeting at the Fairmont Hotel. There were 32 garden clubs involved, meaning that each group was scheduled to make a report. How do you control a meeting where there would be 32 reports to be made? And all by women? I called my brain trust together to discuss a possible solution. The notice of this important conference received widespread publicity, particularly in the garden pages of all the local newspapers. Norvelle Gillespie, well-known garden editor of the San Francisco Chronicle, noted, "John Brucato is prepared to chair this meeting and is planning to see it through the weekend. John has stated that everyone will be given an opportunity to speak. Good luck, John." The clubs' representatives were informed that each report would be limited to three minutes, which was to be controlled by a large-size hourglass. It was referred to as a three-minute egg timer. No one objected. It was to be quite an experiment. Some doubted the possibility of limiting a woman down to just three minutes. Well, everything turned out fine. No one lasted the full three minutes since many were able to complete their reports in just two minutes. Everyone was quite pleased and I received a standing ovation for my efforts. Although I was prepared to leave town in a hurry, I was sure relieved with the outcome. The next project was to get special, reduced water rates for the Victory Gardeners. We had to go before the city's Public Utilities Commission, which was now headed by a tough general manager named Ed Cahill. He practically threw me out of his office when I proposed the special rates for the gardeners. I urged him to consider the important need for this assistance, but to no avail. I also curtly informed him that he would soon be able to get a bird's eye view of a thriving Victory Garden in the Civic Center just by looking out his window. I went to see Henry Budde, who at that time was president of the Park Commission and hadjurisdiction of the Civic Center Park. He lost no time in the planting of a model garden. As a matter of fact, it was fully planted in three weeks. I was quite sure that Cahill must have seen this masterpiece each time he came to the window. Several weeks went by and the best I got from Ed Cahill was that "he had the proposal under study." Having had some experience in city procedures, I figured that perhaps the decision would be made in six months, one year, or more. It seemed that we always came up with solutions when we hit a stone wall or a hardplace. The newspapers and radio stations were the answer. Editorials appeared in all the four dailies, the San Francisco Progress, neighborhood papers, and practically all of the radio stations. They all urged the need for reduced water rates in order to grow food for the war effort. This all happened in late November of 1942. As a typical politician susceptible to the spotlight, Ed Cahill and the Public Utilities Commission shined. I was expecting a call from the city hall. Cahill invited me to his office, remarked how very much impressed he was with the success of the Victory Garden program, and offered his help. The following week, he presented a resolution to the PUC recommending their approval of the reduced rates for the Victory Gardens. After many flowery speeches by the commissioners, the water department was motivated to come up with a reduced rate that would be acceptable for all parties concerned. Our original goal of 60,000 Victory Gardens was almost an accomplishment. We were out to plant every square foot available. The program was now going full blast. Experts from the colleges, farm advisors and farmers assisted in conducting neighborhood clinics, not only in the care and growing of vegetables, but in canning and preserving the surplus grown. Like "Schnozzle" Durante would have said, “Everyone was getting into the act." The State Department of Agriculture issued a bulletin stating that the value of the vegetable crops grown in the San Francisco Victory Gardens was over $1,750,000. (There was no inflation in those days. That was real hard cash.) The city provided patrols to guard against sabotage or pilfering. The Board of Supervisors passed an ordinance containing heavy penalties to protect the city farmers from those who stole their produce. Pest control teams were formed to assist gardeners with the ever-increasing problem of insect and plant disease control. The more we planted, the more the problem. The biggest of all seemed to be the garden snail. The snail has an interesting history. Sometime in 1890, there was a French importer of snails in North Beach who supplied the many flourishing French and Italian restaurants with edible snails. The French called them escargot while the Italians referred to them as crastune. It seemed that one day, the good monsieur importer forgot to cover his six cases of snails, which just arrived from France. There was no doubt that there were hundreds of these luscious creatures in those crates. Seeing the light, they crawled out and disappeared into the sunset. Since that auspicious moment of freedom, the snails just spread out in every direction; first to the truck farms of the Bay Area, and eventually into every corner of our heavy producing agricultural state of California. All kinds of controls were used. You might say that the controls were temporary with little success as to extermination. A snail lays a minimum of 300 eggs, which hatch and spread. They are quite prolific. Again, we called the brain trust together. What was the solution? There were no new answers. Being of Italian origin, a bolt of lightning struck me with such a suddenness that I wondered why we did not think of it before. I was sure that the California garden snail, being of French origin as previously stated, was edible. Many old timers in North Beach's Italian and French colonies assured me that the snails were just as good, if not better (because they were fresh), than the imports from the Mediterranean countries. I talked to my father who was a retired importer from New York. He gave me the name of a reputable snail importer for the New York market and other areas where people of Latin backgrounds were his customers. We wrote a letter to the Anthony Puca Company, importers of snails and cipollini in New York City. Puca replied by stating that he certainly was interested inasmuch as there was a scarcity of crastune, because of the ongoing war which cut off his Mediterranean suppliers. He gave us packaging and shipping instructions. There was widespread publicity as to this turn of events. The local press headlined, "Snails in Your Garden? Don't Worry. . . Eat 'Em!" People reacted by saying, "Oh, the slimy things." It had to be explained that the snail was a clean morsel of food. It only ate vegetation, unlike the crabs, lobsters, or other crustacean, which were actually "low down scavengers." "How to gather, cook and serve the common brown snail for human consumption," was the subject of a fine point list of instructions issued by the Chamber of Commerce yesterday. 'Snails are a delicacy that have been enjoyed by Orientals and people of mediterranean extraction for centuries,' the Chamber said in offering this list of suggestions. 1. Gather only live snails. 2. Place snails in covered containers allowing air. Put in either corn meal, bran or grated stale bread for the snails to eat. The 'feeding' or curing period requires fifteen days and then they are ready to boil alive. 3. Boil in water for ten minutes. 4. Change the water and boil another ten minutes, season and serve." Thus, we added a new source of food, a plentiful source. We never went into the snail business. The demand would have been to supply 5,000 pounds per week. The war came to an end and Antonio Puca resumed the importing of snails from France, Italy, Spain, Algeria, and other Mediterranean sources. We gradually expanded from food production to food conservation. The army was taking more and more food from every possible source in order to maintain a well-fed force. All of a sudden, another crisis hit the farmlands—a shortage of harvest labor. Vegetables were quickly maturing and decaying on the ground. Many farmers, unable to harvest their lettuce, cauliflower, artichokes, cabbage and other perishable crops, began to plow them under to at least get some fertilizer out of their efforts. Max Leonard, agricultural commissioner of San Mateo County, called the matter to my attention. We publicized what was going on in hopes of getting volunteer harvest labor. Not everyone could work in the fields, especially doing stoop labor and under sometimes-unfavorable conditions. We were able to strike a good source of labor when we asked our Board of Supervisors to make it possible to release 200 prisoners at the San Bruno Prison, which was owned by San Francisco. The suggestion worked out exceedingly well. Under supervision and "on their honor," the prisoners went to work, were paid for their labor, and helped out in a big way. Since the army wanted the vegetables, they were asked and supplied some manpower as well. The spirit of cooperation was everywhere. The vegetable crops were instantly saved, the farmers were happy, and the Victory Garden Council added one more notch to its long list of achievements. We had passed our goal of 60,000 Victory Gardens. Dr. Archie Cloud, using the facilities of the City College of San Francisco, conducted an intensive survey. 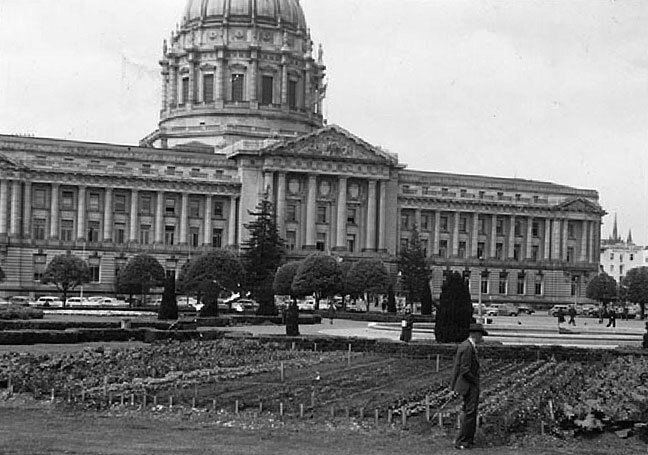 His official figures documented that San Francisco had over 70,000 Victory Gardens. When we practically reached the saturation point in the successful Victory Garden program, we were asked by the War Services Committee to see what could be done in the food conservation section. Thus, ended an interesting era that brought many people together in a common cause they called the "Backyard Revolution." Victory Garden in front of San Francisco City Hall, August 2008. SF Victory Gardens was featured on Dec. 26, 2008 in an hour-long KPFA 'Full Circle' Radio piece. Produced and Co-Hosted by Ali Budner, the show examines the historical WWI and WWII Victory Garden programs, as well as San Francisco's contemporary Victory Garden program, SF Victory Gardens. In the first half, Ali and her co-host discover Victory Gardens through a conversation with Victory Garden Historian Rose Hayden-Smith. In the second half, Ali speaks with SF Victory Gardeners Brooke Budner and Blair Randall. Corn flourishes in 6-month Victory Garden in front of City Hall, August 2008.